Today I’m thinking about Ritual. This year, 2018, I have called my Year of Temperance, because my project is to find and feel more balance in my life. So I’m not just running from one thing to another all the time. So I’m not glossing over crucial moments in my life, always focussing on other tasks. So I don’t feel so frantic, and I have more white space in my mind to dream bigger and build bigger. I like the concept, and the intention. Five months in, I can't say I'm all that Temperate yet. But I'm working on it. 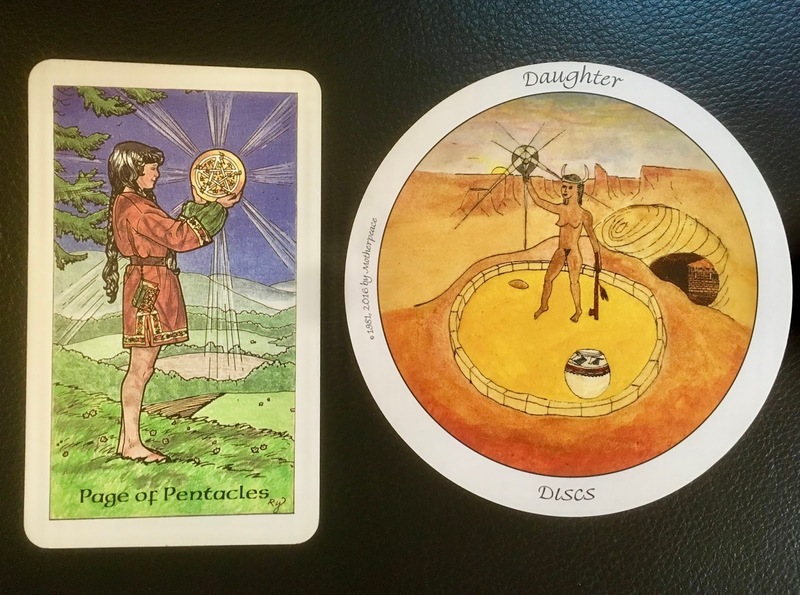 On Wednesday I drew the Page of Pentacles as my Crux Finder Card of the Day. I suggested to my community that we LOOK at our money, and our income streams. On Thursday, by and for myself, I drew the Daughter of Discs. Different deck, same card. What exactly am I supposed to look at, Tarot? What is the message I need? This card shows a young girl holding a coin up before her. Gazing at it, exploring it, wondering at it, seeking to understand it. The image in the card appears ceremonial, ritualized, but the child simply looks curious and interested. I decided that I wanted a ritual to connect me with money and foster an abundance mindset. It's not that I need to make more money - though I wouldn't say no - but that I would like to feel more at peace with the income streams I have and their overall continuity. Musicians - freelancers in general - bring in money intermittently and from a wide range of sources. Some weeks my income is primarily from performance, sometimes from teaching, sometimes from my reed business. Some months are exceptionally lucrative, some nearly barren. The money always comes from somewhere - that's my mantra - but sometimes it can be hard to trust in it. The older I get, and the more responsibilities I have in my life, the more I need, right? So the flow of money through my life is important and relevant. So on Friday I went into my journal, and I ceremonially wrote down all of the money that came in that day. I had a number of checks and direct deposits. I thought about each of the people and organizations that had paid me, and about what I had done to earn that money, and I felt grateful for each check and for each gig and each reed and each lesson. I wrote down my feelings of gratitude, and honored the work I had done and the people who had trusted me to do it. And I loved this. I felt better when I had done it. I felt more confident about the future, remembering how many different things I do and do well. I felt more connected to my customers, students, employers. I felt more connected to my money, in a good way. This is a Friday ritual I will keep.